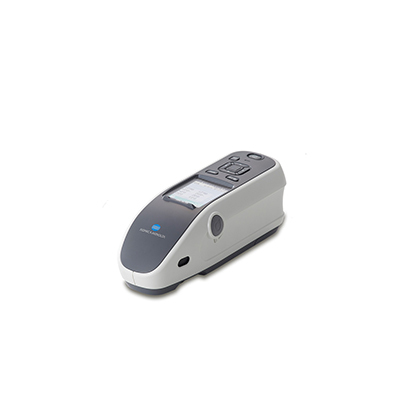 The new Spectrophotometer CM-25cG is designed to measure color and gloss simultaneously. With a forty five zero geometry and a true sixty degree gloss-sensor, this portable spectrophotometer is ideal for measuring automotive interiors. The Konica Minolta Spectrophotometer CM-25cG, with 45°c:0° geometry and integrated 60° gloss sensor, offers simultaneous color and gloss measurement. With changeable apertures of 8mm (MAV) and 3mm (SAV), circumferential illumination system and a measuring time of approximately 1 second, the CM-25cG provide fast, accurate and stable measurement even on curved surfaces. The CM-25-cG, with a symmetrical and compact design, allows easy measurement of hard-to-reach areas within the vehicle interior. The CM-25-cG comes with a true optical sample viewer for perfect sample positioning and is the first instrument to offer such feature in a 45°:0° geometry instrument. The CM-25cG, with high Inter-Instrument-Agreement (IIA) and Inter-Model-Agreement (IMA), ensure perfect measurement data correlation between instruments.